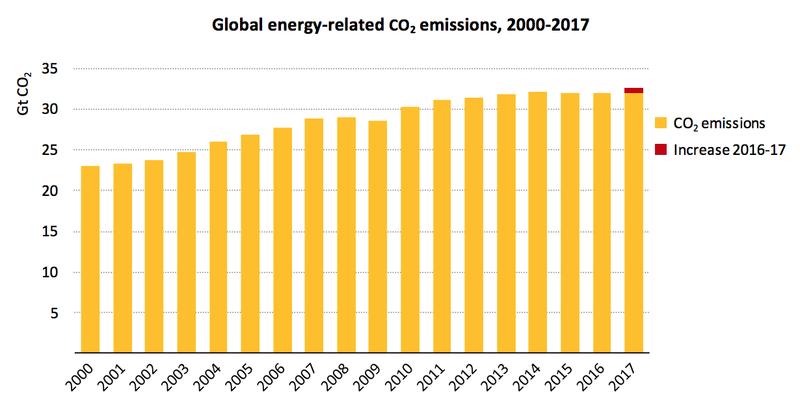 • Energy: Global energy demand increased by 2.1% in 2017, compared with 0.9% the previous year and 0.9% on average over the previous five years. More than 40% of the growth in 2017 was driven by China and India; 72% of the rise was met by fossil fuels, a quarter by renewables and the remainder by nuclear. 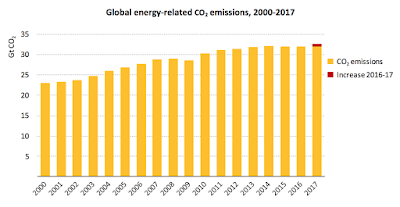 • Carbon dioxide (CO2): Global energy-related CO2 emissions grew by 1.4% in 2017, reaching a historic high of 32.5 gigatonnes (Gt), a resumption of growth after three years of global emissions remaining flat. The increase in CO2 emissions, however, was not universal. While most major economies saw a rise, some others experienced declines, including the United States, United Kingdom, Mexico and Japan. The biggest decline drop came from the United States, mainly because of higher deployment of renewables. • Electricity: World electricity demand increased by 3.1%, significantly higher than the overall increase in energy demand. Together, China and India accounted for 70% of this growth. Output from nuclear plants rose by 26 terawatt hours (TWh) in 2017, as a significant amount of new nuclear capacity saw its first full year of operation. • Renewables: Renewables saw the highest growth rate of any energy source in 2017, meeting a quarter of global energy demand growth last year. China and the United States led this unprecedented growth, contributing around 50% of the increase in renewables-based electricity generation, followed by the European Union, India and Japan. Wind power accounted for 36% of the growth in renewablesbased power output.